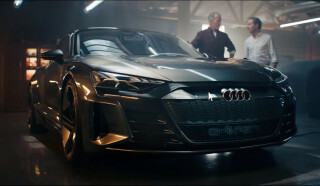 Audi’s 2019 Super Bowl ad for Sunday’s Big Game focuses in on the brand’s electric and electrified future. Like many EV ads, it’s a head-scratcher. In a series of almost clichéd nods to Field of Dreams, Back to the Future, and other movies that would be familiar to the target buyer, a man is walking through an overgrown field and encounters his grandfather, who gives him an emotional welcome and shows him to the barn or old garage. 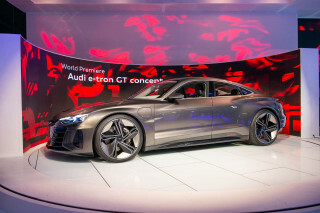 There he reveals the Audi e-tron GT, the brand’s upcoming fastback sedan that was revealed in drivable concept form in November but isn’t due for deliveries until early 2021. Just as the grandson is about to step on the accelerator and be launched back against the seat, he wakes up from his out-of-body experience—or glimpse of the afterlife, some might say—spitting out the cashew he’d been choking on in a very present-day-looking open office. During this, "Spirit in the Sky," the 1969 one-hit wonder of joy and repentance, by Norman Greenbaum, plays in the background. He looks mildly disappointed for a moment, and reading between the lines it may be a long path to real time driving the e-tron GT. A tease of other vehicles rests under covers in the corner of the barn—one of them potentially being the smaller Audi electric crossover, based on Volkswagen’s MEB electric vehicle architecture and expected to debut at the Geneva auto show. At the end of the ad, Audi says—on what will be displayed in some very large letters on American big-screen TVs and bar projectors—that one-third of all Audi models will be electrified by 2025. 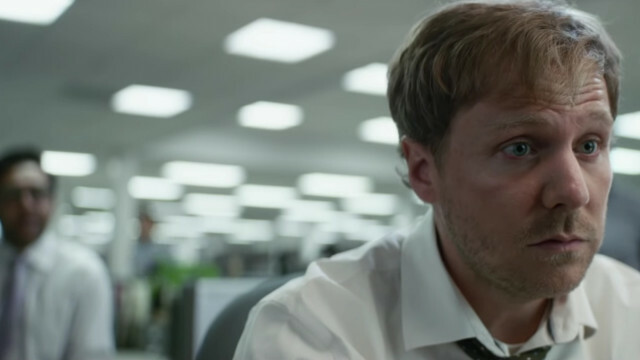 The cost of Audi’s Super Bowl ad is estimated to be more than $5 million in airtime—before considering production costs. It makes Audi a standout for actually putting big ad money behind its electric cars—even before deliveries of the e-tron SUV start in a few months. Automakers, as a whole, have been frugal spenders on EV advertising. 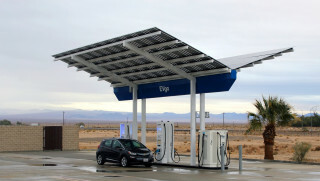 In California and the Northeast, according to a study from NESCAUM, a coalition of Northeastern states for coordinated air-emissions management, Nissan, Toyota, and Ford spent nothing in 2017 on advertising for the Leaf electric car, Prius Prime plug-in hybrid, and Fusion Energi and C-Max Energi plug-in hybrids, respectively. CHECK OUT: Electric cars are on the market, so where are all the ads? Between carmakers and ad agencies, there's no consensus on how to sell the public on electric cars. On one hand, this ad covers new ground—with serious money behind the brand’s message that it’s going electric and it’s not a single model or a novelty. Over the past several years, most automakers have made sweeping declarations about their intent to go electric—and set ambitious targets to go with them. And yet companies haven’t typically put their money behind such CEO speeches and grand press-release statements. On the other hand, this ad lumps electric vehicles into an old, familiar advertising category, in which they’re referred to as something different or transformative but not actually sold. In 2015, BMW spent big money on a Super Bowl ad for the i3, with Katie Couric and Bryant Gumbel. 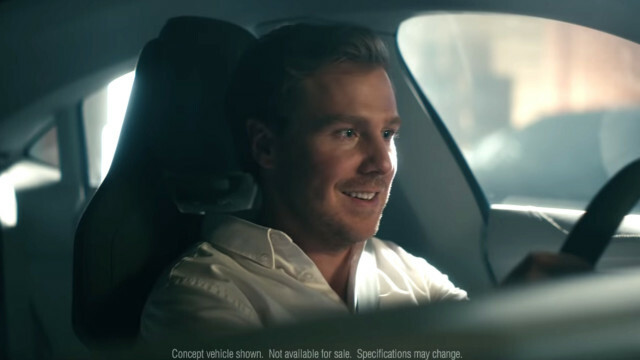 That ad didn’t communicate much of anything about the car and only effectively conveyed what sounded then and now like something dismissive: that it was a new idea and a future that many might just not understand right away. We're wondering, at a big moment to pitch a new crowd on EVs, if this ad does more of the same—leaving out the enticing facts and numbers, the tech glimmer, and the reassurance that the freedom of the automobile is intact. Why is this so hard? Watch it below, and we're eager to see your comments on whether this will hit the spot or not.